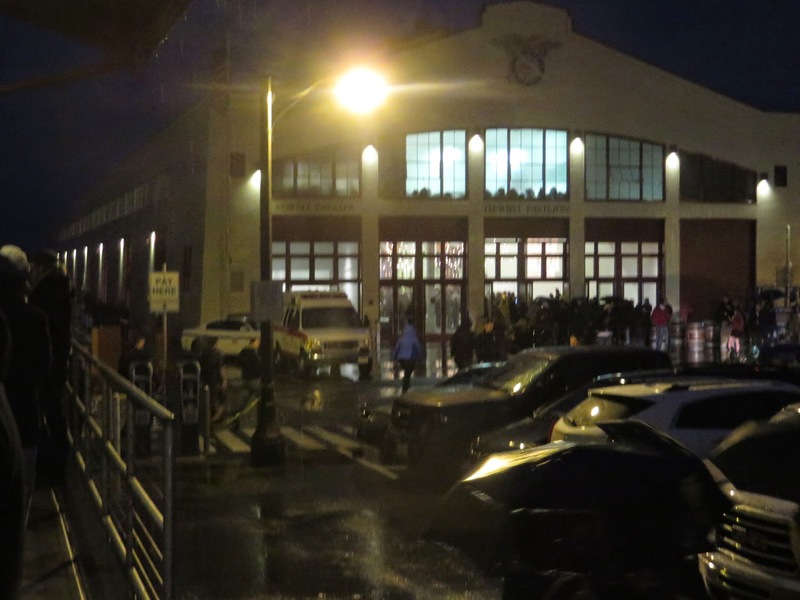 The train gently rolls to stop, the doors open, and I begin the 3.5 mile journey from the San Francisco CalTrain station to Fort Mason, site of the SF Beer Week Opening Gala. It’s only drizzling outside, the forecast was for heavy rain. Unable to find an umbrella when I left home, I put on my red Ohio State University for some protection from the elements. My dad gave me this hat 26 years ago, handing it to me just before I was about to drive myself and all my stuff from their home in suburban Chicago to start graduate school at Ohio State. I’ve worn it all through those years, mostly when I go on runs. I start speed walking through the damp chaos of late afternoon San Francisco. The drizzle stops and cutting through a residential area, a couple women in their 30’s get out of a car. One looks right at me, and says “O-H”. Why is she talking to me? Suddenly, I realize she’s seen my Ohio State hat, and I blurt out “I-O” in response Seems she went to Ohio State, too. I press on. I consider putting in my will to be buried with this OSU hat. The image of my elderly corpse, lying in a casket with a bright red OSU cap on my head jumps into my mind. The line starts moving forward and I’m in! I grab my tasting glass, walk around and see Peter Estaniel in front of the Hermitage Brewing stand. He talks up their barrel aged Sour Pumpernickel Rye Ale, which sounds kind of weird but I don’t resist when he pours a very generous sample into my glass. Wow, it’s got everything: sour, spice, some oak, lots of smooth maltiness. It’s also got 11% abv and my low alcohol plans haven’t gotten off to a good start. After thanking Peter for the beer and wishing him a successful beer week, I tell him “Time for a session beer” before departing. I get a small glass of something called Screaming Eagle Lager s from Iron Springs. Nice beer, and the meager 3.9% abv makes it even better. I begin to check out the rest of the floor. Bison Brewing is pouring Kermit the Hop, an innovative organic beer I’ve long wanted to try. A slender woman with short hair dyed lavender fills my glass, and says “Go Buckeyes! O-H!”. I realize that must be Ashley Routson, aka The Beer Wench who also went to Ohio State. A bit startled, I smile and cheer back “I-O”. After a couple more “Go Buckeyes” between us, I move aside so the person behind me can get his glass filled. Kermit the Hops has all sorts of wonderful hop flavors, an attribute rarely found in organic beers. It also has something like 9.5% abv and my “start slow” plans are really starting to go out the window. I drop by Half Moon Bay Brewing’s stand and find Maverick’s CEO Steve Morgan, and introduce myself. A consummate Northern California net worker, he wants to introduce me to a couple people, but none of them are around. He’s quite gracious about a couple of recent articles on Maverick’s I wrote, and raves about Half Moon Bay’s new Imperial IPA, which has something like 139 ibus, and of course, encourages me to try some. It’s an amazing feat of brewing, very drinkable and in balance with it’s own hop character. Some how all that bitterness doesn’t come across as aggressive, and at something like 8% abv, doesn’t seem very boozy either. Steve introduces me to the Brewmaster of Hop Dogma, which has a small tap room in Half Moon Bay, at the next door stand. His name is a Dan something-or-rather and Steve urges me to try his Imperial Stout that won some big award at a beer competition in Bend, OR. I can see why it won, it’s a great Imperial Stout. It checks in a 10.4% abv and my “start slow” plan is officially dead. I tell Dan I’ll need to check out their small tap room in Half Moon Bay and move on. Steve Donohue of Santa Clara Valley Brewing is holding court nearby. Everyone knows Steve. I ask him how his brewery construction and, responding like every brewer I ask this question to, he takes a deep breath and starts muttering about permits. He tells me “You ought to swing by the place sometime.” I think I will before not too long. Berkeley’s Rare Barrel is pouring some Raspberry Sour that sounds delicious. At 6.5% abv, it seems like a good direction to go. It’s excellent. Next up, Discretion Brewing in Santa Cruz. (OK,it’s actually located in Soquel, close enough.) With my low alcohol strategy officially blown, I ask for the Wheat Wine, a smooth wheat ale at 9-10% abv. I ask the guy filling my glass, “When can I get bottles of your stuff in San Jose.” He shrugs and says, “Well, right now, we’re planning to distribute just in Santa Cruz. I don’t know when we’d get to San Jose.” I get the feeling it will be a long while before Discretion ever shows up in San Jose. Moseying around the hall, enjoying the Wheat Wine, I’m startled to see fellow beer runner Brian Yaeger down from Portland. We chat for a few minutes. He can’t get over how many new breweries are in the hall he’s never even heard of. We talk less about beer, and more about our families before moving on our separate ways. The inevitable time to use the restroom has arrived, Walking to the back of the hall, a couple sees me and whoops “Go Buckeyes, National Champions!”. Turns out they went to OSU and we talk about beating Oregon in the National Championship Game. Bladder depleted, the next beer is something from Wood Brewing. On a hand written index cards, are tap listings like a Pale Ale and IPA. Then, I spot a tap labelled “Honey with locally foraged herbs”. Intrigued, I ask for that. I joke with the lady pouring it, “Did you just walk into Golden Gate Park and grab a bunch of herbs off the ground?” Her non-answer to the question suggests that’s exactly what happened. Then, she sees my Ohio State cap and says, “Oh, I lived a year in Columbus.” As for the beer itself, it’s light with a very menthol character. No abv is listed. I just hope it is low. There were a few other beer samples that evening, but I honestly don’t remember too much about them. I look down at my watch and see it’s 9 o’clock. My head is starting to hurt, another beer sounds like the worst thing in the world and even if I tried to choke one down, my heavily coated tongue wouldn’t detect a single flavor. I fill my glass up with water and stand in a corner to recharge my phone so it still has some life. A large room filled with 2,000 people drinking beer for three hours becomes a very interesting place. People start bumping into each other much more often. Others quietly retreat to the back, sitting quietly in heavy silence trying to recover. The ambient festival noise and background music is increasingly punctuated with goofy laughter and loud high fives. Glasses begin falling out people’s hands, smashing on the floor, eliciting boisterous cheers from the crowd. It doesn’t always look accidental. It’s 9:20, and now seems like a good time to get out. Walking hard through the damp dark yet lively streets of San Francisco the drizzle turns off and on to rain. I keep checking my watch and a mapping app on my phone, making sure I’m on course and still on time to catch the train. As I near the station, the winds start to really gust at times, and I grab my OSU cap to keep it from blowing off my head. Waking up, I look outside and see we’re Redwood City, half way home. Jolted, I put my hand on top of my head, and realize I’m not wearing my OSU hat. I stand up, look on the floor, the seat in front me,the seat behind me, and check my pockets a couple times. Not willing to accept the obvious reality, I check the floor and seats around me again a third time. My OSU hat is gone. 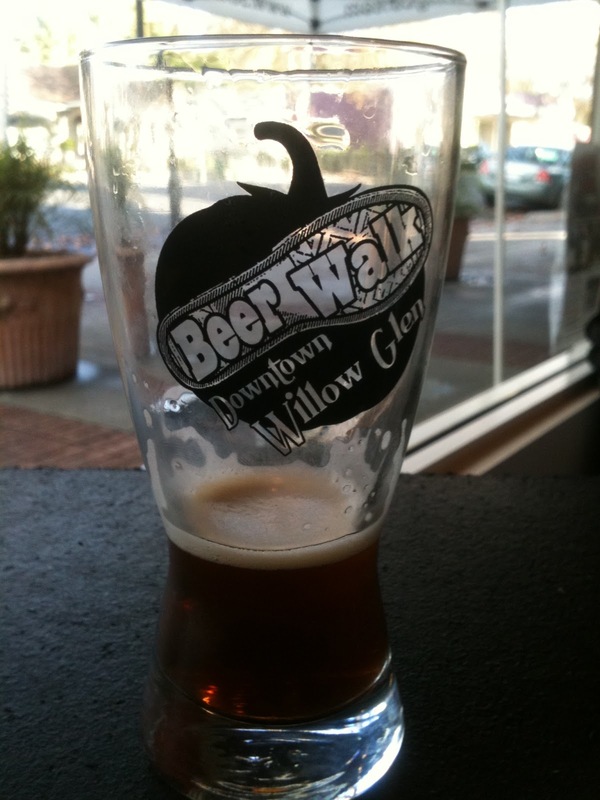 Give credit San Jose’s Willow Glen Business Association for coming up with a bright idea, the Downtown Willow Glen Beer Walk. For thirty-five bucks, they give you a tasting glass and map of downtown Willow Glen indicating where no fewer than 26 business were pouring various beers to taste between 2 and 6 pm last Saturday afternoon. 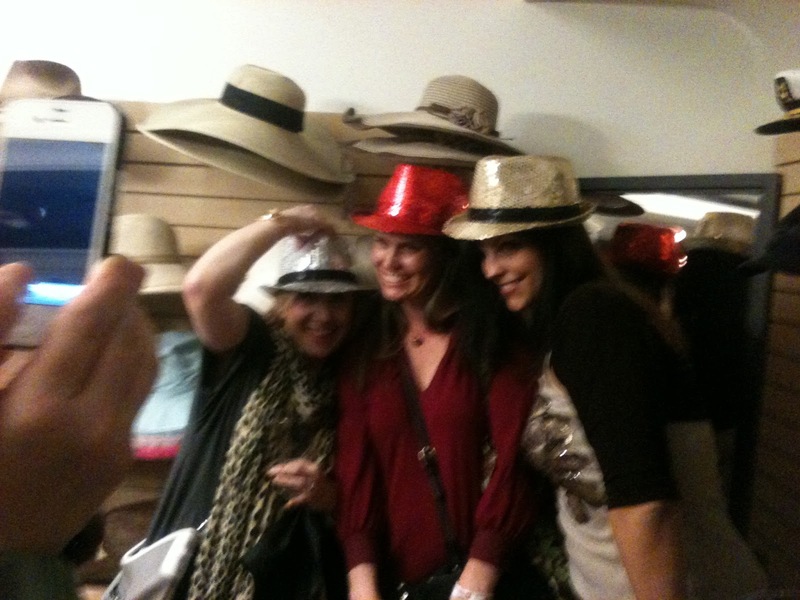 The idea of course, is to get new customers to walk into stores they might not otherwise go into in search of beer. And just maybe as each beer walker contemplates the malt-hop balance of the latest California IPA amidst shelves of, say beauty products, they might see something they like and buy it. And I have to say it worked. My wife and I ventured into plenty of new stores during the Beer Walk and let’s just say we bought a few things. And while each pouring location is indicated and the entire brewery list is provided, the actual location were each brewery is pouring is cleverly left to be discovered by each participant on the beer walk. 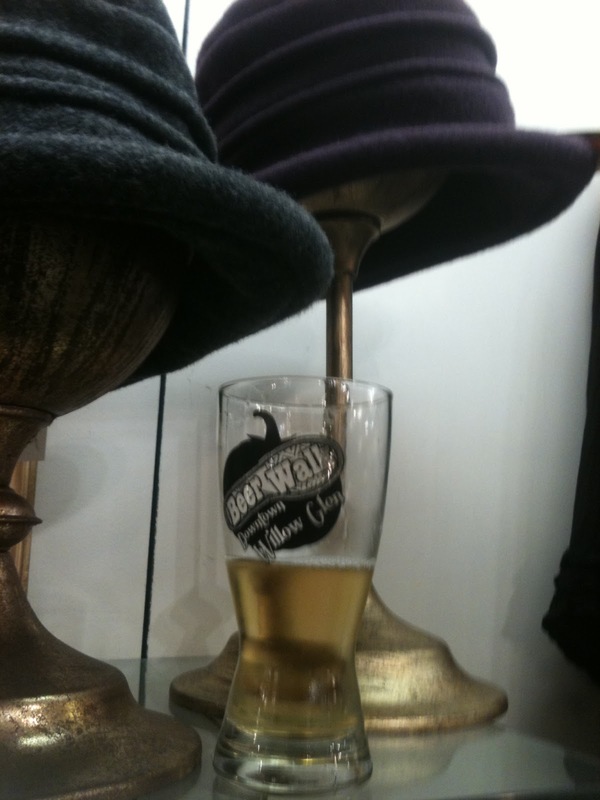 So it was with great suspense as we entered a Hair Salon or Clothing Boutique, looking to see what beer awaited us. I often exclaimed things like “Cool! 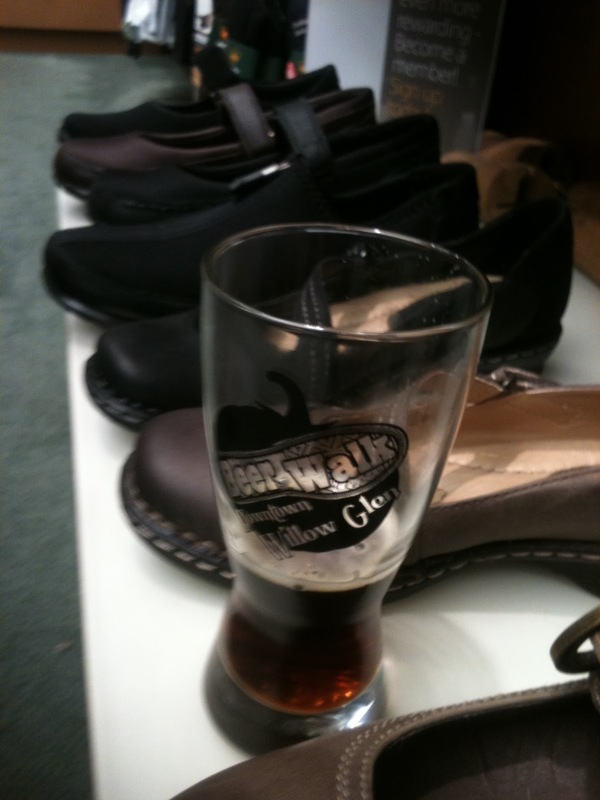 They’re pouring Firestone-Walker here!” as we walked into realty office once the mystery beer became apparent. We found this unlikely beer festival to be a blast, arguably the most fun we’ve ever had at a tasting event due to its off-beat and unpredictable nature. And while this may have been a good marketing idea for Downtown Willow Glen, I suspect a number of proprietors hadn’t figured on a bunch of very tipsy beer walkers clogging their stores during the last hour of the beer walk, stumbling around with little interest in buying merchandise to the chagrin of the non-beer walking customers who probably wished they had chosen a different time to do their shopping. As you can see from the photos, I had plenty of goofy fun with my iPhone taking pictures of my tasting glass in unlikely locations. Hope you enjoy my photographic artistry! I’m not a cyclist, but figure there’s a few cyclists our there that read this who would be interested in the Biketoberfest Marin. Excellent list of brewers. Have to say it look’s so good, I might get myself a bike just so I can participate. A highly-anticipated annual festival, Biketoberfest Marin attracts cyclists and West Coast brewers alike in a combined bicycle expo and stellar brewfest! Held in Fairfax—the birthplace of the mountain bike—the event is not only Marin County’s premier bicycle event but is also a fundraiser for and presented by the Marin County Bicycle Coalition (MCBC) and Access4Bikes (A4B). Last year the event drew over 5,000 cycling and beer enthusiasts from all over Northern California and raised $20,000 for MCBC and A4B. Biketoberfest will feature a celebrity road ride (with “Fast” Freddie Rodriguez) mountain rides, live music, great food, family activities, a Cargo Bike Jubilee, dozens of bicycle, component, nutrition and athletic attire vendors, a women’s skills clinic with Pro Catharine Pendrel, and 25 West Coast brewers serving over 40 beers! It’s a great way to have fun while helping a good cause. 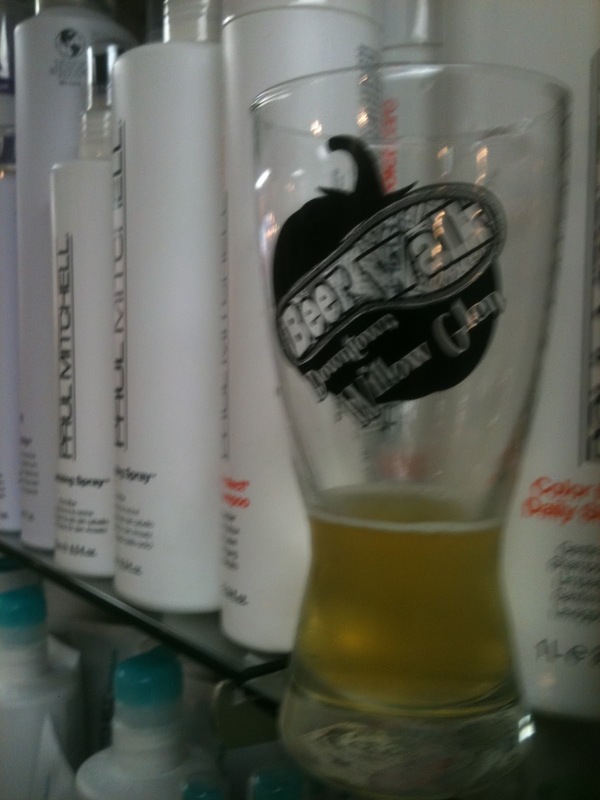 COST: FREE Admission; brewfest tasting $25 advance, $30 day-of. 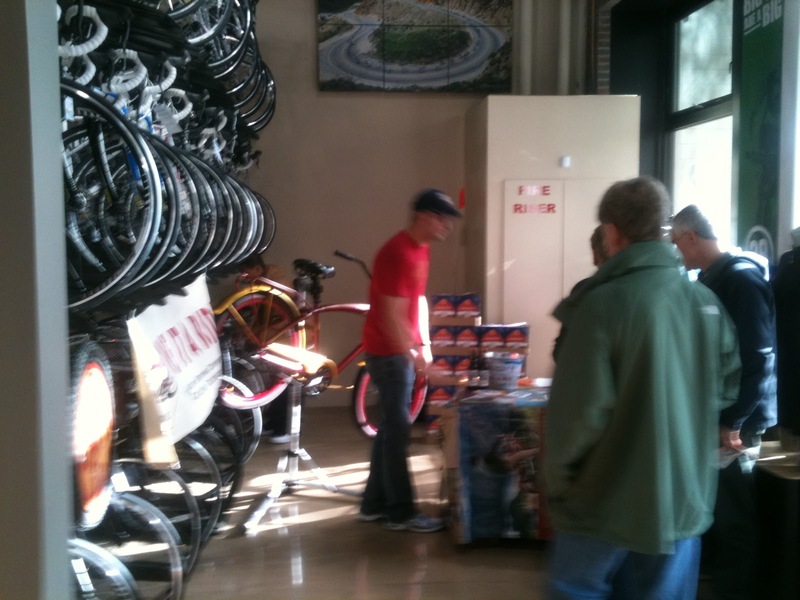 Proceeds from Biketoberfest benefit bicycle advocacy in Marin County. The Brewing Network is holding it’s 2nd Annual Winter Brews Festival on January 29th in Berkeley from noon to 4 pm in Berkeley at The Martin Luther King Center in Berkeley. I went to the 1st Winter Brews Festival last year, and for a first time event, I thought they did a great job. 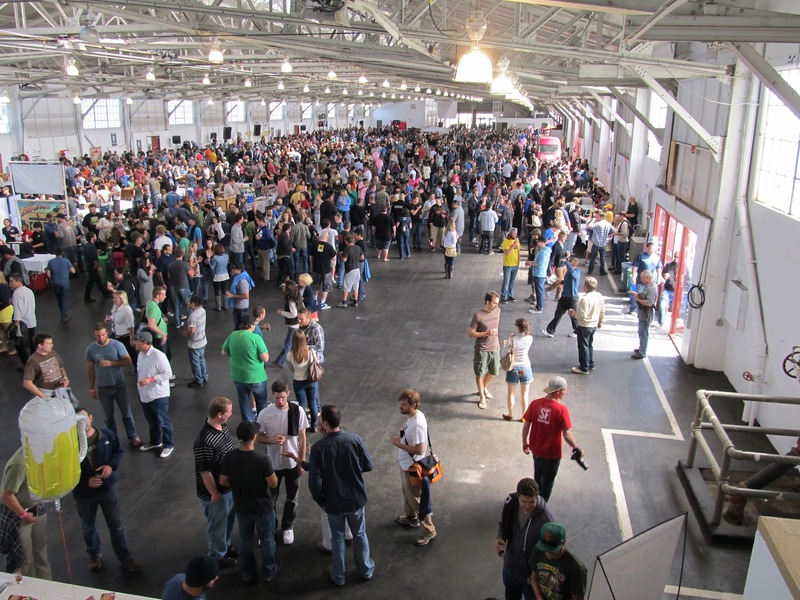 So if you want to tune up your beer festival skills before SF Beer Week, or would like to try out some great beers from local breweries, check it out. You can find out more at www.thebrewingnetwork.com/ontap. 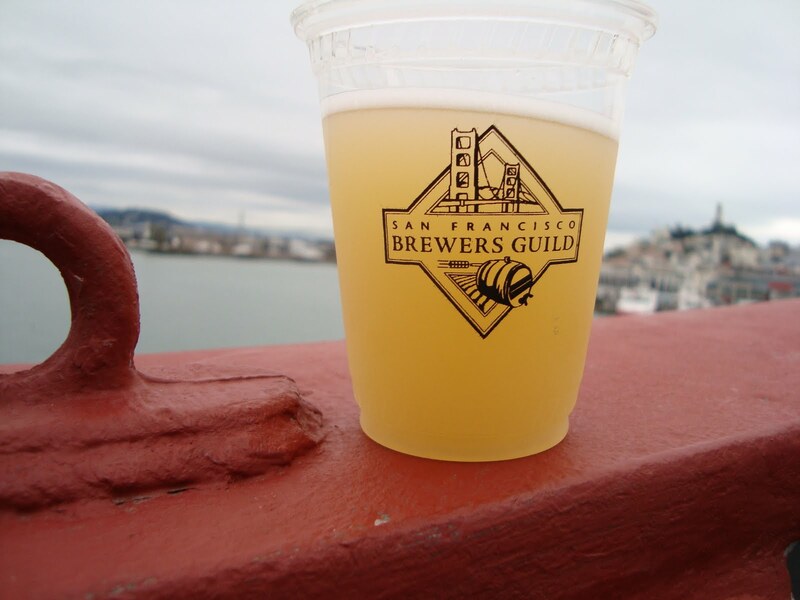 The Brews on the Bay beer festival, hosted by the San Francisco Brewers Guild is a pretty simple concept. Each member of the guide sets up a few taps along the deck of the S.S. Jeremiah O’Brien, a World War II era supply ship permanently docked to a pier in San Francisco’s Fisherman Wharf. Before you climb the stairs to enter a ship, they give you a plastic cup. For four hours, you walk around to the various brewer stations on the ship’s deck, and ask the servers to fill your cup with one of their selections on tap. When you get tired of walking around the ship, drinking beer, and enjoying great views of San Francisco from the ship, you leave. Or, 5 pm rolls around, and they kick you the ship. Oh, and there was a Van Halen cover band this year, if you’re in to that sort of thing. 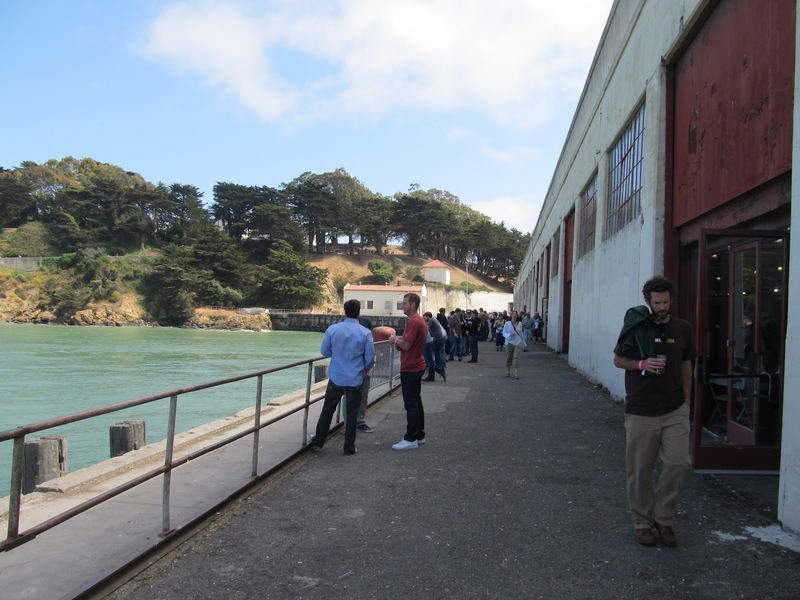 It’s a good opportunity to see what the many great San Francisco breweries are up to. And like any good beer festival, there’s a few brewers around, most of whom will gladly tell you about there beer, and are also good for picking up a home brewing tip here and there. A while plenty of breweries poured there tried and true brews, there were enough specials and seasonals pouring to make it interesting. Here’s a few random observations from that afternoon. –21st Amendment poured their new Imperial IPA, Hop Crisis. One would think the Bay Area needs another big Imperial IPA like most people need another hole in their head, but if you tasted this one, you’d likely disagree. It’s big and powerful, with a strong strong hop vibe, but makes it work is its sturdy malt character that provides a good balance and almost viscous mouth feel to this brew. 21st Amendment plans to release it in four-pack cans this coming spring. I don’t know about you, but I’ll be looking for it. 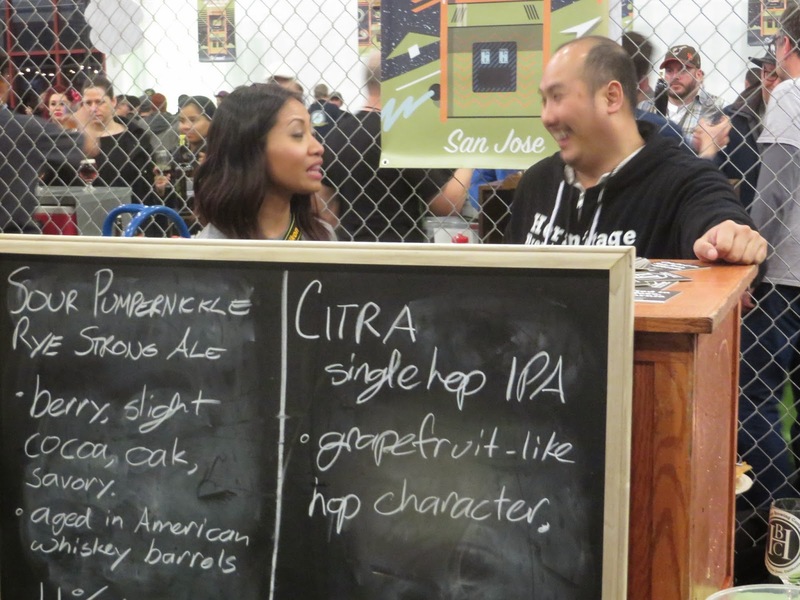 –Social Kitchen & Brewery made their Brews on the Bay debut. I was rather fond of their Rapscallion, a pretty intense Belgian Ale with a zippy ginger-like aromatic spiciness and light apricot notes. Their Big Muddy Weizenbock has plenty of roasty malt, some banana-like esters, and a little clove like spicy vibe to it. I need actually go to their brew pub and actually purchase some of their beers. -Also enjoyed Rum Runner from Thirsty Beer. It’s got a lot of molasses in it, as well a 120L Crystal Malt, and British Aromatic Malt. It’s lightly sweet, malty and molassessy. (Is “molassessy” a word?) If you ask me, molasses in beer is way under rated, and I’ve got to love a beer with “Runner” in the title. Since I’m having some problem with my camera, I decided to use a picture for last year’s Brew’s on the Bay, just in case anyone would actually notice.